A cathedral dean has been suspended by his bishop and could face trial by a church court. John Methuen, the Dean of Ripon, is charged with "conduct unbecoming the office and work of a clerk in holy orders". The Bishop of Ripon and Leeds, John Packer, took the action after a number of written complaints about the dean. A church spokesman refused to give any more details. Mr Methuen said he was "entirely innocent". The complaints will first be considered by an independent examiner - probably a lawyer - who should report by the end of the year. If the examiner finds there is a case to answer, the dean will appear before consistory court which is normally chaired by a judge. If the court finds against him, the dean could be stripped of his office. In a statement to the cathedral congregation on Sunday, the bishop said he had taken this action "to eliminate as far as possible continued pressure and gossip". In his statement, Mr Methuen said: "I have committed no offence, ecclesiastical or otherwise and will strenuously defend myself within the proceedings." 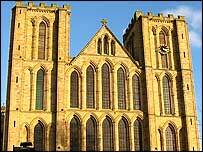 The 57-year-old dean has been at Ripon, one of England's oldest cathedrals, since 1995. In recent years the chapter clerk, the bursar and the organist at the cathedral have all resigned. An inquiry into the dean's conduct was made by a panel which included the then Bishop of Knaresborough, the late Frank Weston, and the then Dean of York, Raymond Furnell. The results of that inquiry were not made public.